Six days have passed since college student Maura Murray crashed her car on a rural highway in northern New Hampshire and disappeared without a trace. But as family, friends, and investigators continue their search for the 21-year-old Hanson native, two questions continue to baffle them: Where was Murray going, and what was she running from? A junior in the University of Massachusetts at Amherst’s nursing program, Murray was doing well in school. She had a dedicated boyfriend, a loving family, and close friends. Her father, Frederick, had just told her he wanted to buy her a new car. But on Monday, Murray apparently decided she needed to get away from life for a while. In short order, she withdrew a few hundred dollars from an ATM machine, packed her cellphone wall charger and her favorite stuffed monkey into her Saturn, e-mailed her professors to tell them she wouldn’t be in class all week, and headed north for the White Mountains. Whatever her intended destination was, she never made it there in her car. At about 7 that night, while taking a sharp turn on Wild Ammonoosuc Road in Woodsville, N.H., Murray lost control and slammed into a snowbank. Shaken by the accident, and apparently intoxicated, Murray told a witness she didn’t need help, local police said. The witness went to call the police and by the time they arrived Murray was gone. Using tracking dogs, helicopters, and trained searchers, local and state police, as well as state fish and game officials, covered nearly 20 miles along Route 112, but found no trace of Murray’s footprints in the snow. The tracking dogs lost her scent within 100 feet of the accident, leading investigators and her loved ones to believe she either hitched a ride and continued on her way, or was abducted. Murray, a former top student and track star at Whitman-Hanson Regional High School, is described by friends and family as a responsible, attractive young woman who is very close to her family, in particular her father, who spend yesterday checking bus stations in New Hampshire and Vermont for any signs of her. 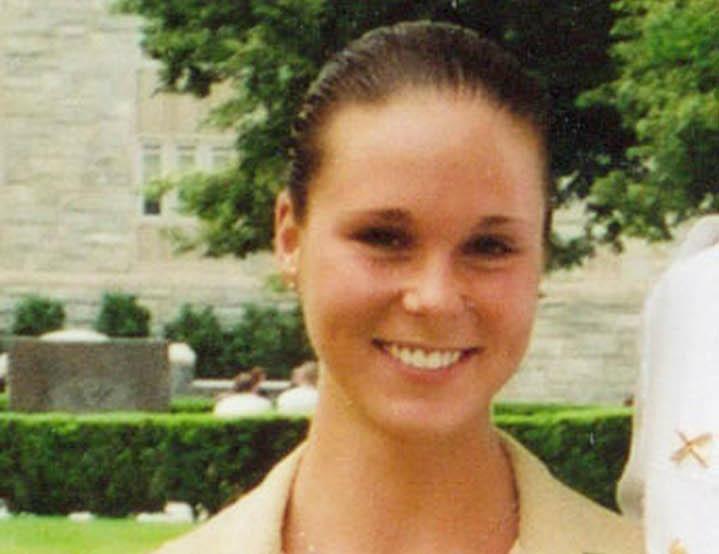 A self-reliant woman, Murray toughed out three semesters as a chemical engineer at the US Military Academy at West Point before deciding the Army wasn’t for her. Since transferring to the University of Massachusetts, she has been a successful student in the nursing program, said dean Eileen Breslin. ”Nursing students are very responsible. That’s part of her character,” said Breslin. If Murray was troubled by something, family and friends said, it might have been a small car accident she got into last Saturday night, when she damaged her father’s new Toyota. The day after the accident, she called her boyfriend, Army Lieutenant Bill Rausch, who is stationed in Oklahoma, in tears. A day later, on Monday, she got into her Saturn and headed north. Rausch, who got a leave of absence from the Army, arrived in New Hampshire on Thursday. Joined by his parents, who drove from Ohio, and by Murray’s father and some of her siblings, Rausch has spent the past few days driving across both New Hampshire and Vermont, stopping at local gas stations, bus stations, and police headquarters, asking whether anyone has seen Murray. Yesterday morning, Rausch and his father were told that Murray might have been at a McDonald’s in St. Johnsbury, Vt. They drove there, but no one had seen her. ”Obviously, we’re hoping for the best. If I just got some news, although I guess no news is good news,” Rausch said. Rausch said Murray fled with a backpack, but left many of the other items she’d packed, including the stuffed monkey he gave her and her favorite book, “Without Peril,” behind in her car. A witness told local police Murray appeared to have been intoxicated at the time of the crash, and Rausch said that there was an open bottle of alcohol in the car. However, he said he’d never known Murray to drink and drive, and guessed she might have fled out of fear she’d broken the law. Breslin, UMass’s nursing dean, said Murray had e-mailed a professor on Monday indicating she needed to take time off because of a “family problem” and will return to class this week. Her family and friends, have since spent hours plastering missing posters and calling news agencies to get her picture and story out. ”I’m hoping someone will see her and call someone to let us know she’s all right. We’re just sitting on eggshells waiting for that,” said Laurie Murray, Murray’s mother, a nurse at the Samuel Marcus Nursing Home in Weymouth.